#13 "GM Adventure - Khazad Khizim, Treasure Trail Rules Expansion, Helping Diabolical Game Masters"
This issue is 88+ pages with full-color front and back covers. 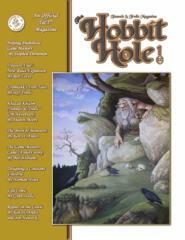 Inside this large issue you will find: Of Hairy Feet and Taters... Editorial, T&T ARTICLES: Helping Diabolical Game Masters, Treasure Trail New Rules Expansion, The Birth of Monsters By Ken St. Andre, Designing a Constant Universe, T&T Rules for Bravery, Fear, Terror and Insanity, Take a Left Turn on the Road Less Traveled..., Tavern Talk and A Road Map to Solo Land. SOLO / GAMING: Khazad Khizim (Dwarf Fist) (A very exciting Tunnels & Trolls GM Adventure), The Serpent's Nest By Andy R. Holmes (A short 1st level Tunnels & Trolls 5th Edition GM Adventure) and Hedrien's Elixir (A Tunnels & Trolls Solo). FICTION: The Game Masters Game and Rogues in the Castle By Ken St. Andre and Jon Hancock OTHER: Comic Grumlahk's Troll Tales By Jeff Freels, Comic Ugh By Gynn Stella and Artist Feature.